214540 8280 Iveco 8280 series diesel engine. 214541 8280SRC20 Iveco 8280SRC20 Automotive Diesel Engine Spare Parts Catalog. 214542 8280SRC21 Iveco 8280SRC21 Automotive Diesel Engine Spare Parts Catalog. 214543 8281M32 Iveco 8281M32 Marine Diesel Engine Service (workshop / repair) Manual. 214544 8281M32 Iveco 8281M32 Marine Diesel Engine Spare Parts Catalog. 214545 8281SM32 Iveco 8281SM32 Marine Diesel Engine Spare Parts Catalog. 214546 8281SRM44 Iveco 8281SRM44 Marine Diesel Engine Service (workshop / repair) Manual. 214547 8281SRM44 Iveco 8281SRM44 Marine Diesel Engine Spare Parts Catalog. 214548 8281SRM50 Iveco 8281SRM50 Marine Diesel Engine Spare Parts Catalog. 214549 8281SRM70 Iveco 8281SRM70 Marine Diesel Engine Service (workshop / repair) Manual. 214550 8281SRM70 Iveco 8281SRM70 Marine Diesel Engine Spare Parts Catalog. 214551 GE8281M32 Iveco GE8281M32 Marine Generator Set Spare Parts Catalog. 214552 GE8281SRM44 Iveco GE8281SRM44 Marine Generator Set Spare Parts Catalog. 214553 8281I03 Iveco 8281I03 Industrial Diesel Engine Service (workshop / repair) Manual. 214554 8281I03 Iveco 8281I03 Industrial Diesel Engine Spare Parts Catalog. 214555 8281Si10 Iveco 8281Si10 Industrial Diesel Engine Service (workshop / repair) Manual. 214556 8281Si10 Iveco 8281Si10 Industrial Diesel Engine Spare Parts Catalog. 214557 8281Si15 Iveco 8281Si15 Industrial Diesel Engine Spare Parts Catalog. 214558 8281SRE10 Iveco 8281SRE10 Industrial Diesel Engine Spare Parts Catalog. 214559 8281SRi10 Iveco 8281SRi10 Industrial Diesel Engine Service (workshop / repair) Manual. 214560 8281SRi10 Iveco 8281SRi10 Industrial Diesel Engine Spare Parts Catalog. 214561 8281SRi26 Iveco 8281SRi26 Industrial Diesel Engine Spare Parts Catalog. 214562 8281SRi27 Iveco 8281SRi27 Industrial Diesel Engine Spare Parts Catalog. 214563 8281SRi40 Iveco 8281SRi40 Industrial Diesel Engine Spare Parts Catalog. 214564 8281Si10 Iveco 8281Si10 Genset Engine Service (workshop / repair) Manual. 214565 8281Si15 Iveco 8281Si15 Genset Engine Spare Parts Catalog. 214566 8281SRG75 Iveco 8281SRG75 Genset Engine Spare Parts Catalog. 214567 8281SRG85 Iveco 8281SRG85 Genset Engine Spare Parts Catalog. 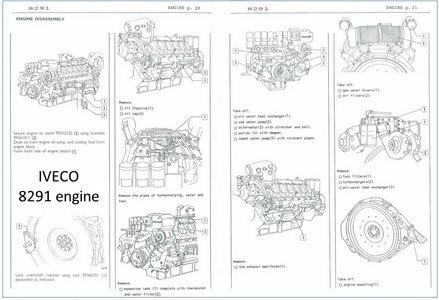 214568 8281SRi10 Iveco 8281SRi10 Genset Engine Service (workshop / repair) Manual. 214569 8281SRi16 Iveco 8281SRi16 Genset Engine Spare Parts Catalog. 214570 8281SRi17 Iveco 8281SRi17 Genset Engine Spare Parts Catalog. 214571 8281SRi26 Iveco 8281SRi26 Genset Engine Spare Parts Catalog. 214572 8281SRi27 Iveco 8281SRi27 Genset Engine Spare Parts Catalog. 214573 GE8281SRG75 Iveco GE8281SRG75 Genset Spare Parts Catalog. 214574 GE8281SRG85 Iveco GE8281SRG85 Genset Spare Parts Catalog. 214575 GE8281SRi26 Iveco GE8281SRi26 Genset Spare Parts Catalog. 214576 GE8281SRi27 Iveco GE8281SRi27 Genset Spare Parts Catalog. 214577 GS8281SRi26 Iveco GS8281SRi26 Soundproofeed GEN Set Spare Parts Catalog. 214578 GS8281SRi27 Iveco GS8281SRi27 Soundproofeed GEN Set Spare Parts Catalog. 214579 PU8281SI10 Iveco PU8281SI10 Power Unit Spare Parts Catalog. 214580 PU8281SRI10 Iveco PU8281SRI10 Power Unit Spare Parts Catalog. 214581 8281SRG75 Iveco 8281SRG75 Automotive Gas Engine Spare Parts Catalog. 214582 8281SRG85 Iveco 8281SRG85 Automotive Gas Engine Spare Parts Catalog. 214600 8291 Iveco 8291 series diesel engine. 214601 8291SM49 Iveco 8291SM49 Marine Diesel Engine Service (workshop / repair) Manual. 214602 8291SRM11 Iveco 8291SRM11 Marine Diesel Engine Service (workshop / repair) Manual. 214603 8291SRM12 Iveco 8291SRM12 Marine Diesel Engine Service (workshop / repair) Manual. 214604 8291SRM12 Iveco 8291SRM12 Marine Diesel Engine Spare Parts Catalog. 214605 8291SRM75 Iveco 8291SRM75 Marine Diesel Engine Service (workshop / repair) Manual. 214606 8291SRM75 Iveco 8291SRM75 Marine Diesel Engine Spare Parts Catalog. 214607 8291SRM85 Iveco 8291SRM85 Marine Diesel Engine Spare Parts Catalog. 214608 8291SRi15 Iveco 8291SRi15 Industrial Diesel Engine Spare Parts Catalog. 214609 8291SRG75 Iveco 8291SRG75 Genset Engine Spare Parts Catalog. 214610 8291SRG85 Iveco 8291SRG85 Genset Engine Spare Parts Catalog. 214611 GE8291SRG75 Iveco GE8291SRG75 Genset Spare Parts Catalog. 214612 GE8291SRG85 Iveco GE8291SRG85 Genset Spare Parts Catalog. 214613 8291SRG75 Iveco 8291SRG75 gas Spare Parts Catalog. 214614 8291SRG85 Iveco 8291SRG85 gas Spare Parts Catalog. 214620 8360 Iveco 8360 series diesel engine. 214621 8360SRC20 Iveco 8360SRC20 Automotive Diesel Engine Spare Parts Catalog. 214622 8360SRC21 Iveco 8360SRC21 Automotive Diesel Engine Spare Parts Catalog. 214623 8360SRC22 Iveco 8360SRC22 Automotive Diesel Engine Spare Parts Catalog. 214624 8360SRC46 Iveco 8360SRC46 Automotive Diesel Engine Spare Parts Catalog. 214640 8361 Iveco 8361 series diesel engine. 214641 8361M16 Iveco 8361M16 Marine Diesel Engine Service (workshop / repair) Manual. 214642 8361SM21 Iveco 8361SM21 Marine Diesel Engine Service (workshop / repair) Manual. 214643 8361SM21 Iveco 8361SM21 Marine Diesel Engine Spare Parts Catalog. 214644 8361SRM32 Iveco 8361SRM32 Marine Diesel Engine Service (workshop / repair) Manual. 214645 8361SRM32 Iveco 8361SRM32 Marine Diesel Engine Spare Parts Catalog. 214646 8361SRM37 Iveco 8361SRM37 Marine Diesel Engine Service (workshop / repair) Manual. 214647 8361SRM38 Iveco 8361SRM38 Marine Diesel Engine Spare Parts Catalog. 214648 8361SRM40 Iveco 8361SRM40 Marine Diesel Engine Service (workshop / repair) Manual. 214649 8361SRM40 Iveco 8361SRM40 Marine Diesel Engine Spare Parts Catalog. 214650 8361i00 Iveco 8361i00 Industrial Diesel Engine Spare Parts Catalog. 214651 8361i01 Iveco 8361i01 Industrial Diesel Engine Spare Parts Catalog. 214652 8361i01 Iveco 8361i01 Industrial Diesel Engine Service (workshop / repair) Manual. 214653 8361Si10 Iveco 8361Si10 Industrial Diesel Engine Service (workshop / repair) Manual. 214654 8361Si10 Iveco 8361Si10 Industrial Diesel Engine Spare Parts Catalog. 214655 8361Si11 Iveco 8361Si11 Industrial Diesel Engine Service (workshop / repair) Manual. 214656 8361Si11 Iveco 8361Si11 Industrial Diesel Engine Spare Parts Catalog. 214657 8361SRE10 Iveco 8361SRE10 Industrial Diesel Engine Spare Parts Catalog. 214658 8361SRE11 Iveco 8361SRE11 Industrial Diesel Engine Spare Parts Catalog. 214659 8361SRI10 Iveco 8361SRI10 Industrial Diesel Engine Service (workshop / repair) Manual. 214660 8361SRI10 Iveco 8361SRI10 Industrial Diesel Engine Spare Parts Catalog. 214661 8361SRi11 Iveco 8361SRi11 Industrial Diesel Engine Spare Parts Catalog. 214662 8361SRI12 Iveco 8361SRI12 Industrial Diesel Engine Service (workshop / repair) Manual. 214663 8361SRI12 Iveco 8361SRI12 Industrial Diesel Engine Spare Parts Catalog. 214664 8361SRi13 Iveco 8361SRi13 Industrial Diesel Engine Spare Parts Catalog. 214665 8361SRi15 Iveco 8361SRi15 Industrial Diesel Engine Spare Parts Catalog. 214666 8361SRi25 Iveco 8361SRi25 Industrial Diesel Engine Spare Parts Catalog. 214667 8361SRi26 Iveco 8361SRi26 Industrial Diesel Engine Spare Parts Catalog. 214668 8361SRi40 Iveco 8361SRi40 Industrial Diesel Engine Spare Parts Catalog. 214669 8361SM21 Iveco 8361SM21 Genset Engine Spare Parts Catalog. 214670 8361SRi25 Iveco 8361SRi25 Genset Engine Spare Parts Catalog. 214671 8361SRi26 Iveco 8361SRi26 Genset Engine Spare Parts Catalog. 214672 8361SRM32 Iveco 8361SRM32 Genset Engine Spare Parts Catalog. 214673 GE8361SRi25 Iveco GE8361SRi25 Genset Spare Parts Catalog. 214674 GE8361SRi26 Iveco GE8361SRi26 Genset Spare Parts Catalog. 214675 GS8361SRi25 Iveco GS8361SRi25 Soundproofeed GEN Set Spare Parts Catalog. 214676 GS8361SRi26 Iveco GS8361SRi26 Soundproofeed GEN Set Spare Parts Catalog. 214677 PU8361SI10 Iveco PU8361SI10 Power Unit Spare Parts Catalog. 214678 PU8361SRE10 Iveco PU8361SRE10 Power Unit Spare Parts Catalog. 214680 8365 Iveco 8365 series diesel engine. 214681 8365.26 Iveco 8365.26 Industrial Diesel Engine Service (workshop / repair) Manual. 214700 8460 Iveco 8460 series diesel engine. 214701 8460M15 Iveco 8460M15 Marine Diesel Engine Spare Parts Catalog. 214702 8460SM19 Iveco 8460SM19 Marine Diesel Engine Spare Parts Catalog. 214703 8460SM22 Iveco 8460SM22 Marine Diesel Engine Spare Parts Catalog. 214704 8460SRM28 Iveco 8460SRM28 Marine Diesel Engine Spare Parts Catalog. 214705 8460SRM45 Iveco 8460SRM45 Marine Diesel Engine Service (workshop / repair) Manual. 214706 8460SRM50 Iveco 8460SRM50 Marine Diesel Engine Spare Parts Catalog. 214707 8460SRE10 Iveco 8460SRE10 Industrial Diesel Engine Spare Parts Catalog. 214708 8460SRE12 Iveco 8460SRE12 Industrial Diesel Engine Spare Parts Catalog. 214709 8460SRi10 Iveco 8460SRi10 Industrial Diesel Engine Service (workshop / repair) Manual. 214710 8460SRi10 Iveco 8460SRi10 Industrial Diesel Engine Spare Parts Catalog. 214711 8460SRi11 Iveco 8460SRi11 Industrial Diesel Engine Service (workshop / repair) Manual. 214712 8460SRi11 Iveco 8460SRi11 Industrial Diesel Engine Spare Parts Catalog. 214713 8460SRC20 Iveco 8460SRC20 Automotive Diesel Engine Spare Parts Catalog. 214714 8460SRC21 Iveco 8460SRC21 Automotive Diesel Engine Spare Parts Catalog. 214715 8460SRC22 Iveco 8460SRC22 Automotive Diesel Engine Spare Parts Catalog. 214720 3230MA Iveco 3230MA series diesel engine. 214721 GEF3230MA Iveco GEF3230MA Genset Spare Parts Catalog. 214722 GEF3240MA Iveco GEF3240MA Genset Spare Parts Catalog. 214723 GEF3250MA Iveco GEF3250MA Genset Spare Parts Catalog.